We can expect the Federal Reserve to leave rates low until the job market turns the corner. The overnight rate stayed between 0 and 1/4% for the entire year. Increases in government spending at the federal level will be partially offset by cuts in local and state government budgets. State and local governments were definitely in cut mode. The federal government spending was huge as the stimulus money was spent in many areas. Here in Northern Virginia, we see the new Metro link from Tysons Corner to Dulles Airport project dominating the landscape. Somewhere in the later half of 2010, I expect the job market to reverse course as employers slowly start adding people to their payrolls. Unemployment remained stubbornly high with no relief the entire year. Stocks should continue the up and down motion as the Dow Jones seeks higher ground. Wall Street is in the green for 2010. All key indexes are up for the year and we are currently enjoying a year end rally. Any increase in consumer confidence will translate into profit since companies have reigned in their fixed costs. Will restaurants start filling their dining rooms mid-week? Despite lots of restaurants seeking Chapter 11 bankruptcy protection early in the year, the industry is flat to up and creditors are allowing most reorganization plans to gain approval. Look to travel indicators for signs of increased mid-week business. When airlines and hotels begin to see increased volumes, restaurants will find business travelers in their seats. Don't expect many $100 bottles of wine on business expense accounts this year. Frugal is in vogue. Hotel occupancy rates have improved and the year end party news from downtown Manhattan had a frugal flavor. 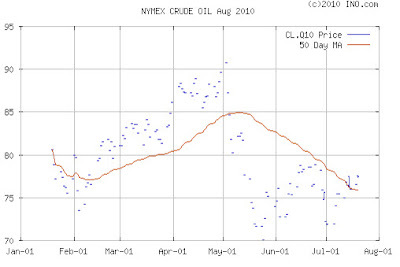 I expect oil to remain below $100 per barrel. I'm still accurate with this prediction but the markets are unseasonably high as 2010 comes to a close. Overall, 2010 will be better than 2009 as the long slow recovery takes root. Overall, 2010 was a big improvement over 2009 for most Americans. The big group experiencing persistent unemployment is a notable exception. Most restaurants have an automated ordering system (POS) which can be queried for menu item counts for any given data range. This data is quite helpful for the forecasting team in restaurants using a limited menu or a menu with a central focus (either by cuisine or main ingredient). Unwieldy menus do not allow a quick menu item count forecast (using historic POS data) to effectively buy most key items. At the core, most forecasts begin with the cover count or number of guests expected to arrive in a given time period. Adding the check average to this cover forecast will provide the people designing a shift schedule with a target. Simply take the covers times the check average times the target labor percentage. This is the budget for the period. Food cost control is not a percentage game in the planning phase. Although most use food cost percentage to measure results, the number won't help you predict what food to order, store, prep and bring to the line for any given period. Cover counts and check averages will provide a broad target. Making the target work is a tougher task. For many raw ingredients, the ability to use unsold product in future meal periods has a significant impact on your food cost results. Limited menus put a short list of ingredients in play every single day. They don't need to worry how to use any leftover cheese at Domino's Pizza. Pizza is on the menu tomorrow. In contrast, operators using menus relying on daily specials for a major share of sales will have a much more demanding job to use up leftover stock. The purchasing forecast depends on par stock targets for many shelf stable items. In a typical kitchen, a much greater share of the food cost dollar is spent on perishable meat, fish and produce. The error penalty for over ordering a shelf stable condiment is minimal when compared to fresh white fleshed fish. You will often see seafood specialists with chalkboards. Late in the dinner shift on a busy night, they want to run out of fish if the next day's forecast is for a slow Sunday or Monday. My favorite Italian restaurant in New York does not offer fish on days when the fish market is closed (Saturday and Sunday). Some chefs pay air freight to get fresh fish in the door as fresh as possible. You want to avoid over buying any highly perishable raw ingredient. Just ask your self a simple question: "If I order more than I can use today, will I be able to sell the leftovers tomorrow?" Once you move away from fresh fish and poultry, dairy and produce are highly perishable and are frequently purchased by specialists. If your operation doesn't justify hiring a specialist, tracking produce waste can help you adjust your pars quickly. I favor either a two-tier or three-tier par stock model. Order more before busy days and less on slow days. I believe using sophisticated software (with menu item counts, standard recipes, standard yields and other recipe model factors) are most useful for companies who have never explored these tools. Often, my clients tell me they wish they had analyzed their menu item costs years ago. The knowledge gained from yield analysis really improves future forecast accuracy. If you learn to translate purchase units of measure into the number of standard portions, you will have a competitive advantage. Your forecast model can now go well beyond covers, check averages and percentages. Take your top 25 items and buy more precisely. The impact is huge. Your site is the best thing I've ever found on food cost. Is my food cost percentage affected by high purchase amounts? I understand that my Food Cost will be high as the value of my inventory will be high, but in terms of % versus sales does it really affect it? Let's say theoretically, I do over purchase, but none of what is purchased spoils and I don't waste anything except for my usual amount of waste in production. Essentially my food cost should stay near to where it usually is correct? Yes. Just don't make it a habit. Chronic over ordering will certainly impact your food cost results in a highly unfavorable manner. Your food cost always equals net purchases. The percentage simply relates the net purchases to your sales volume. In fact, most operators do over purchase food. Their #1 concern is running out of stock. Most ordering models have a safety factor built into the formula. Problems often show up in an indirect way. I have seen employees served crab cakes and roast filet mignon for lunch. Freezers packed with protein items originally purchased fresh and stored in the refrigerator show a high ending inventory total. "Blowout specials" are used to "burn off" perishable items lowering sales and increasing the food cost percentage. Like any industry, we suffer from a lack of flexibility anytime our ending inventory is inflated. Simply stated, your chef won't be able to take advantage of future opportunities if he becomes concerned with proper use of the current stock. In fact, this focus can really produce catastrophic results when you start to look at rehashing protein items. I will offer an extreme example. This example happens to be a true, real-life story. A chef gets a call from a seafood salesman in Alaska. The salesman knows the chef enjoys working with fresh caught Alaskan salmon and halibut. The deal involves an order of 25# of fish with free air shipment. On the delivery day, the UPS driver was sick and his replacement went to the restaurant at the wrong hour (they are a dinner house). The fish made the complete route tour before landing back in the UPS warehouse. The chef had a person try to locate the driver on his route most of the afternoon. This employee drove over 30 miles in Friday rush hour traffic. Eventually, he went to the warehouse and waited for the fish. At 6 PM, he got his hands on the box and the chef had the salmon at 7 PM. Of course, he was compensated for his time and gas used. The wait staff began pushing the salmon special later in the dinner shift since the fish needed to be prepped and the manager needed to add this special to the POS system. The special was not included on the original printed specials page. It was immediately added to the chalkboard. Menu pages were reprinted. They sold 75% of the fish over the weekend despite the problems. By Monday, the remaining salmon was frozen. Did the chef get a good deal? To his credit, he did not offer a "blowout special" on the slow Monday. Alaskan salmon changes dramatically in taste and texture once you freeze and thaw the fish. The frozen product was eventually used in a fish soup. The story illustrates some of the issues you need to consider. A small amount over purchased in your low point of the week will be consumed in a special during the busy times. However, a large buy for the busy days will not be consumed on a slow night. When the salmon was eventually used in the soup, there were plenty of local fish species available for a fraction of the price paid for the air shipment. As you increase the number of protein options on your menu, the likelihood of waste and spoilage does increase. Your assumptions may not jive with reality once the number of protein options hits 10. If you serve a diverse menu, you expect to live with a manageable level of spoilage and waste. When this level becomes too high, the food cost percentage will suffer. I am really grateful for your prompt answer and the time you dedicated to answer my query. I apologize for not presenting full information as I had serious doubts I would receive an answer! b) the total cost of the food ingredients for all meals together. Once again, I thank you dearly and look forward receiving your feed back. I worked in the remote site feeding and support services division of Sodexo for 9 years. We tracked all of our costs per man-day. If you carefully track your cost of all ingredients each day and divide this sum by your manday count, you'll arrive at an actual cost per man-day. The other meal level information is your standard cost data. You need to hit 10 per man-day and you have targets for each meal period. I would recommend you divide the day into two parts - Midnight/Breakfast (target is 4) and Lunch/Dinner (target is 6). You can isolate most operational problems and focus on a solution if you get closer to the actual variance. You may find the 1.5 breakfast target is too low but the lunch target of 2.5 is too high. Of course, you could look at each meal independently each day. On our camps, we served large beefsteaks twice a week. Workers (our customers) consumed over 5,000 calories per day. They were working hard in the frigid regions of Northern Canada and Alaska. Steak Nights were a major component of our food cost results. We knew the cost of the steaks served and the average number of steaks consumed since the impact was high. We served buffet style meals in an all-you-can-eat format. Our guests were served the entree and sides by one of the chefs or cooks. All salads, desserts, rolls, etc. were self-serve. Beverages were self-serve. Our team knew the cost of the salad bar, the dessert station, the beverage station and average condiment usage. The cost of the items served by our main line varied based on a cycle menu. If your operation is similar to the one I described, I recommend using a week as your report period. Most cycle menus will begin to track a tight cost range for each week of the cycle. You will find great variations on the dinner meal period based on the day in the cycle and the cost of the protein and produce items. Thank you for your article "Food cost basics" which is published in foodservice resources. If I am serving 20 Breakfast, 30 lunch, 50 Dinner and 10 midnight meals for the same customer , how could I calculate the average food cost per person knowing that the cost of the meals are as follows : breakfast =1.50, lunch and dinner = 3.00 and midnight meal is 2.50? A. 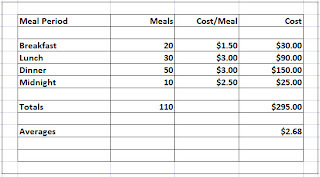 Multiply the cost of a meal by the meal count for each meal period. B. Add the total meals and total costs. 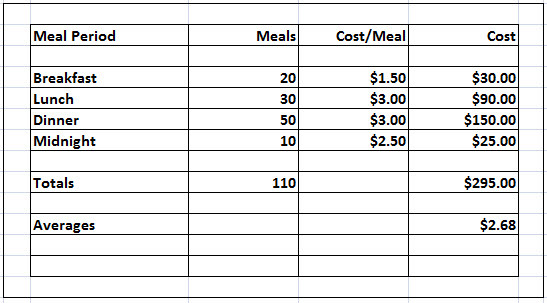 C. Divide the total costs by the total meals to find your average cost per meal. Your food cost percentage depends on your sales and your costs. For each meal period, you need to multiply the price times the count to get your sales for each period. Add the sales and divide your total costs by your total sales. Most restaurants purchase raw ingredients and produce and sell finished menu items. Our management accounting should be structured in a manner similar to a manufacturing operation. The wait staff should be considered the sales force. They meet the customers and help them order a delicious meal. We find a beehive of activity on or near the production line in most restaurants. The wait staff wants to rapidly fill orders and the production staff handles orders as efficiently as possible given the equipment constraints and staff levels. Unlike most manufacturers, a majority of food service managers do not track work in progress and finished goods inventory. Our finished goods are immediately delivered to the dining room. The terms batch recipe, sub-recipe or prep recipe are used to describe the items produced ahead of the meal period. These items are available to the line cooks and are used to produce more complex menu items. Common prep items are sauces, dressings, stocks, casseroles and other items which take longer than the typical meal cycle to produce. Butchering, produce cleaning and other prep activities convert raw ingredients into portioned items and salad mixes. Food service operators need clear policies to handle these inventory valuation issues. Inventory valuation is important since the cost of goods sold depends on consistent treatment to determine beginning and ending inventory values. There are many different accounting policies employed by major food service companies. One of the largest hotel management companies in the world does not use food inventory in their balance sheet and income statements. Food cost reflects all food received from their suppliers each period. Other companies do not value any work in progress inventory. These operators use a prep cooler and management's goal is to minimize the amount of food in this zone. Due to the increase in report complexity, we often miss the opportunity to evaluate the true cost of batch recipe production. The key reason for tracking batch recipe production, including the cost of direct labor, is the ability to compare the total cost with the available packaged goods. Salad mixes using romaine lettuce are very popular. For many companies, the value added by cleaning and trimming the vegetables and heads of lettuce does not justify the cost increase. The packaged salad mixes offer a high quality alternative with very low labor costs. Operators are trying to manage relatively high production costs. Salad production involves many hidden costs: transportation of unusable trim, water used to clean vegetables (often left running during the prep), garbage removal to discard the unusual trim, and higher volatility in market costs. The direct labor is not completely hidden but may be cloudy when the workers handling prep also work in other stations. So what? Why should anyone care about these issues? The cost of meat and seafood requiring butchering and vegetables requiring prep may be over 50% of your cost of goods sold. You may have significant hidden profit buried in your operation. The amount of hidden profit may justify a quarterly study comparing prep vs. direct purchase on several key items. If you have a policy of producing everything from scratch, you need reports which allow you to monitor production. During the month, three fellow restaurant consultants have contacted me about menu engineering and recipe costing with specific questions regarding Excel. Excel charts do not automatically create the popular four quadrant chart with Stars, Plowhorses, Puzzles and Dogs (or any of the other 4 quadrant variations). I have accomplished this task using a few third party utilities. In my analysis, recipe costing is accomplished using software specifically designed for this purpose. I consider the POS system Product Mix report the source of the key data. 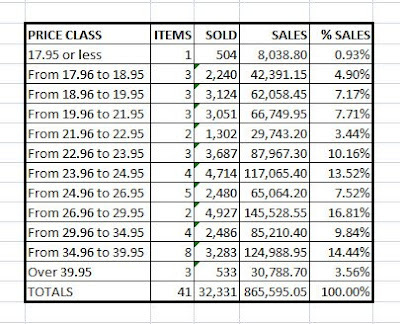 Since menu engineering is concerned with selling price fluctuations, the PMIX report has all essential data (number sold and selling price) except the cost to produce each item. Most POS systems have Excel file export capability. If you are adept at the table look-up formula, you can place the exported data exactly where you need it in your model. 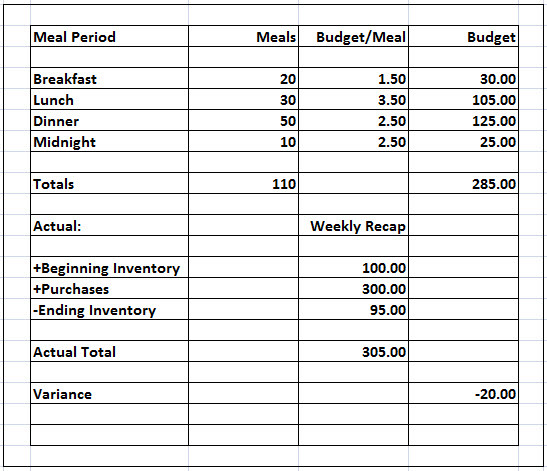 Generally, I use good old data entry to update the recipe costs using the numbers from the software. Once I have the number sold, selling price and recipe cost, the sophisticated menu engineering and analysis reports flow from Excel. The four quadrant chart is not the only report produced. You can use sorts and filters to generate a tremendous amount of valuable information. Anyone who wants an all-in-one solution for inventory, recipe costing, purchasing, menu engineering and requisitions really needs to invest in a proper solution. Excel tables are famous for errors in formulas and there is no audit trail for your purchases (which feed all cost calculations). Many people have asked me for a recommendation. I do not own a restaurant and I do not have a laboratory in my office with 20 different recipe costing programs loaded and ready to test. In fact, many of the popular software solutions come out with substantial improvements each year. It would be a full-time effort for anyone to honestly provide this type of service. Many of the popular solutions target a segment and do a terrific job. FoodTrak moved from a restaurant model to a hotel/resort model around 2000. They added transfers and requisitions to the essential restaurant reports already in the program. The reasons I tend to work mostly with FoodTrak: longevity and optional cost methods. They have been around since 1980 and I started my company in 1990. If you need FIFO cost numbers, you won't find a better solution for the investment. There are other programs in the six figures range which have true FIFO but I am assuming very few of my readers would invest $100,000 plus for a solution. There are many programs capable of decent reporting using the last cost method. I encourage anyone on a tight budget to start with one of these solutions for recipe costing needs. My name is Steve and I am starting a new job as a Sous Chef but haven't learned anything about food costs or labor costs and I am afraid to not be able to be a team player on this important situation, that I am final realizing that its part of my job. Can you please teach me how to do all of this or point me in the right direction. I have read your basics on food cost but still I am having trouble understanding it all. Thank you for your time. The goal of food purchasing is to place the food in inventory as close to actual production as possible. People who are pros know delivery dates and times, par stock levels, minimum drops, shelf life, and most important, the forecast for the order period. The food cost formula is really a report card on how well you forecasted for the orders. Most food service companies have several backup suppliers they can use if they experience sales far beyond the forecast. Typically, these last minute purchases are made at cash and carry stores with much higher prices. The heart of the food cost formula is purchases. You simply divide net purchases by sales. If you forecast your sales carefully, you will make better purchase decisions. As a learning tool, you may want to take a look at 4 or 5 weeks of invoices to see past purchases. You can discuss spoilage and waste with the chef. Ordering is most important before busy periods. You need to have adequate supply without creating excessive waste. If you keep score, you will rapidly improve. My most popular blog post this year is by far the Outlook 2010 which was published in early January 2010. I thought it would be interesting to see how well my predictions have fared during the first half of 2010. The Federal Reserve Board has cooperated with business borrowers leaving the over night federal funds rate at record low rates (zero to 1/4%). Despite the BP debacle, the crude oil markets have remained in check and well below the $100 per barrel threshold. 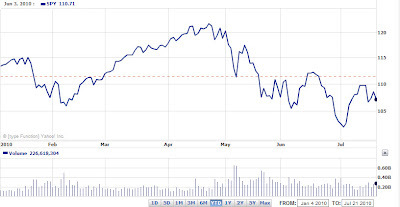 Stocks should continue the up and down motion as the Dow Jones seeks higher ground. Any increase in consumer confidence will translate into profit since companies have reigned in their fixed costs. Both the Dow Jones Industrial average and the broader S&P 500 index have seesawed back and forth in the search for direction. Corporate profits are definitely higher than 2009. There was a short clip on CNBC today regarding higher occupancy rates at the Starwood Hotels group. Many of my clients who have a significant business expense account clientele report a gradually improving climate. Guests are reviewing check totals quite carefully. The role of a food cost controller is much different from the menu analyst. Cost control relies entirely on historic data to prepare reports which quantify results and alert management to possible problems or opportunities. On the other hand, the menu analyst needs to look to the future. When a menu price revision takes place, the prices need to cover the future costs and provide a reasonable profit. Knowledge of commodity trends, economic forecasts, unique events in the coming year and other future oriented information is helpful. The costs used to arrive at theoretical menu item costs should use these expected prices. The food cost controller studies purchase data to understand the previous period. Use of theoretical food cost data may help the controller discover a usage problem. Usage problems involve units rather than dollars. There is concern regarding missing steaks or shrimp or perhaps an entire case is gone. Purchase costs are important only when there is a big swing in price on one or more high volume items. Using the same price data for both menu planning and food cost control is a mistake. The portion sizes for all key items should be 100% exact. It is the prices which need to vary. Many operators simply take an educated guess on overall inflation and raise menu prices across the board with the same % increase. Ideally, the menu analyst benefits from the ongoing work of the food cost controller. Portion control tests, relative price volatility and other information the controller has at their fingertips is valuable to their counterpart. They should work together to discover how the current menu has performed. 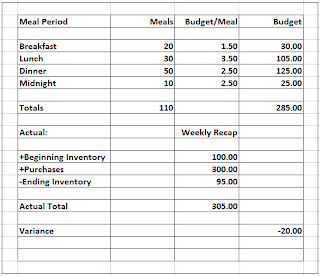 In a highly collaborative organization, the cost control team could utilize information from the menu analysis team (e.g. future menu price revision strategy) to create better budgets. There are significant differences between financial accounting and management accounting goals. Financial accounting depends on accurate and consistent inventory valuations. Both methods require perfect purchase cutoffs. I consider the cutoff of purchasing activity to be the highest priority. I am amused at operators who go to great lengths in valuing inventory items (3 places to the right of the decimal point) and also allow deliveries during the inventory count. My early career inventory work involved an inventory count during an active delivery time of day. The food cost percentage was sky high. An entire shipment of meat was included in purchases and excluded in the inventory counts. Since the operation had shifted into meal service, the recently received meat was being consumed in meal production. The solution used by management involved adding the meat purchases to the inventory counts on the sheets. OK So why bother with increased accuracy on the average purchase price of a case or pound when you are careless with the actual count you use in your valuation? This is more common than many people realize. A liquor thief used to begin his counts early in his shift while the dinner meal was in progress. All he had left at the end of the meal was the partial bottles in the main bar area. His Excel sheets were a complete joke. He had a count of 30 bottles on an item. I asked where the cases were and he said he meant to put 3 bottles. Since the company paid no attention to specific bottles, an error like this would allow him to steal 2 full cases undetected by the "inventory control" report. At some time, usually once a year at year end, the higher ranking accountants enter the inventory fray and beat up the team on average purchase costs and a selection of inventory counts. They recommend 2 people on every month end count and careful price look-ups for average purchase prices. Most theft occurs in central storage and in the top consumption areas: kitchen and main bar. In operations where the menu items are placed in service area storage for self-service, late shift over production is a often undetected form of theft. Good managers should take a count one hour before closing and a second count 10 minutes before closing time. If your count went up, you have a possible theft problem. If your operation takes a truly accurate inventory only once a year, you are possibly burning 3 to 5 percent of sales in theft and waste (conservative estimate). Some people purchase software systems to track perpetual inventory. Accurate beginning inventory counts are required in any perpetual calculation. Purchases must be entered immediately upon receipt if you need shift based reports. A powerful cost accounting report may be produced weekly. Accurate counts taken during periods when deliveries are prohibited and the kitchen is closed are the key. Valuing these accurate counts should be consistent. If you use the last price paid, look up this cost. Software solutions may automatically use the last cost. Some of the more sophisticated solutions use average cost or FIFO. If you follow this straight forward approach, your annual financial inventory valuation will be a snap. As many readers have noted over the years, we are working to put dollars in the bank. Frequent and consistent percentage analysis will help you identify consistency issues. Beyond percentage analysis, the ideal cost vs. actual cost report highlights specific ingredients ranked by dollars of variance. This analysis involves production and sales data, standard recipes and detailed purchase records. If you are late to the theoretical cost movement, I urge you to start with the center of the plate ingredients. Get a handle on your high volume, perishable protein items first. Eventually, you will build a more comprehensive standard recipe file. When this day comes, I expect you will find most of the major variances will be center of the plate ingredients. My confidence comes from experience. Perishable, high volume protein items typically make up the major share of your controllable stock. As you begin building your center of the plate recipe model, focus on entrees. Go ahead and carefully cost the portion for each protein item used in your entrees. If you have time, calculate the cost of your most popular accompaniments for these entrees. Include all complimentary items like rolls, butter, condiments, garnish, salads, etc. These complimentary items account for as much as $3 per dinner cover. Use the cost of the center of the plate ingredient along with your cost of complimentary items to find the gross margin for each entree. Simply subtract these costs from the selling price. This gross margin figure is the core of any useful menu analysis. Menu analysis will take you beyond the food cost % report. You may currently use food cost % to trigger menu item price changes. Menu analysis techniques offer a different point of view. In the absence of menu price changes, purchasing results dominate your gross profit scorecard (as much as 80% of potential gross profit improvement vs. 20% due to tight portion control). The portion cost data is much more useful when employed in menu analysis. Histograms profile the number of data points for each class using a standard bar chart format. In constructing a menu map, I like to see the action in terms of popularity and dollars of sales produced. For this analysis, the data points per bin is the starting point. Knowing the number of menu items offered at each price point helps you later in the analysis. The chart below shows the additional information in columns. Almost 3/4 of sales are produced by menu items priced between $23 and $40. Should this restaurant eliminate the high priced items which are seldom ordered? Menu psychology suggests the very high priced items help make the popular item's prices look attractive. Given the current economy, this philosophy may not work as well as in 2008 (source year for the test data). In fact, the operator is currently pushing pasta entrees during mid-week dinner periods. I'd like to get my hands on the data from last year and make a comparison. In a side by side comparison, I'd expect a shift to lower priced menu items. Here in the Mid-Atlantic, crab cake dinners are very popular. Although jumbo lump crab meat is pricey, diners expect to pay below $30 for two cakes with a salad and sides. The cakes with minimal filler are recommended in the local press and by word of mouth. This means a competitive dinner house serving Maryland jumbo lump meat needs to use about $10 of crab for the entree. Last week, I had a conversation with a neighbor who loves to dine out. He and his wife ordered crab cakes at one of the most well known restaurants in the area. The two cake dinners sold for $28.95. He said the cakes were loaded with bread crumbs. He was quite disappointed due to the treatment he received when he told the manager. He was offered an apology and a free appetizer card. This free card was good for a future meal. They lost a loyal patron and fan. There are 3 classic menu engineering models taught in hotel/restaurant management courses. These models produce much different results when applied to a restaurant with a large number of entree choices. Many people are familiar with the Star, Plowhorses, Puzzles, and Dogs approach which was developed by Kasavana and Smith. This model uses popularity as a function of gross contribution to split entrees into 4 quadrants. The popularity cutoff is 70% of the average number sold. If you sold 1,000 entrees and had 10 choices, any entree with over 70 sold is either a Star or a Plowhorse. The contribution test uses the mean. If the average contribution per plate is $12, items with higher profit would be labeled as a Star or a Puzzle (depending on popularity). The second popular method was developed by Miller. He uses a similar popularity test but focuses on food cost % instead of gross margin. His Winners are popular menu items with a low food cost %. Finally, Pavesic's menu engineering approach uses weighted statistics and looks at profitability as a function of food cost %. There is no 70% applied to his figures since the numbers are weighted by their overall impact on results. I used the 3 methods to evaluate the menu at a seafood and steak dinner house with 41 entree choices. Comparing the ratings to my initial recommendations to the owner, I find myself most in sync with the Pavesic method. I tend to focus on profitability improvement through tighter food cost control. Someone employing the Pavesic method with reliable recipe cost data would come to many of the same conclusions I reached without running the statistics. Miller rated a block of popular menu items as Winners when the Kasavana/Smith approach rating was Plowhorse and the Pavesic rating was Standard. Although I like the Miller approach for the current recession, entrees with lower gross margins may not rate a Winner class unless they achieve a low food cost % figure. If I were advising the same operator today, the Miller approach would factor heavily in my recommendations. Since there is a ceiling on menu item prices imposed by the thrifty diners of 2010, restaurants need to rely more heavily on tight food cost control to achieve profits. I would expect to see fewer sales of high ticket menu items with high gross margins and high food cost % figures since the high selling prices which would support this profile have declined in popularity. Fewer diners are trying to impress with their choices. More diners are looking for a lower check at the end of the meal. I'm not exactly sure when this recession will hit bottom. Most likely, the bottom will not be remarkably different (economically speaking) than today. The rate of job losses has dropped dramatically from the peak but we are still shedding jobs. Many employers have frozen wages and some have asked employees to take more days off without pay. All of this belt tightening has made the American consumer afraid to spend money. This is not a completely negative fact of life. When Americans do not spend as much money on non-essential goods and services, the loss of demand drives prices down in the short run. If you were waiting to purchase replacement equipment, furniture, china, glassware, silverware, and kitchen utensils, you should consider making a small investment in the future now. If you never started a customer loyalty program in the past, you are probably looking at your base clientele in your dining room this month. Patrons who have shunned the bad economy, their New Year's resolutions, volatile weather patterns and the new frugal approach to life here in the states are your fans. Get out in the dining room and say: "Hi! Thanks for joining us tonight. Would you like to join our new frequent dining club?" January in a recession will often produce a low sales number. If you take the sales figure at the end of January and multiply by 12, you will have an excellent figure for forecasts, budgets and business plans. Could you break even if every month this year looked like this January? If you answer yes, you will make money this year and beyond. If you answer no, you have work to do. Pretend it is never going to get better than this month. What would you do differently? By forcing your company to confront the possibility of 2010 staying at the current levels, you will drive your team to innovate. These innovations will provide the path to the future and will create positive cash flow now. If you are swimming in excess cash, should you open a new location? 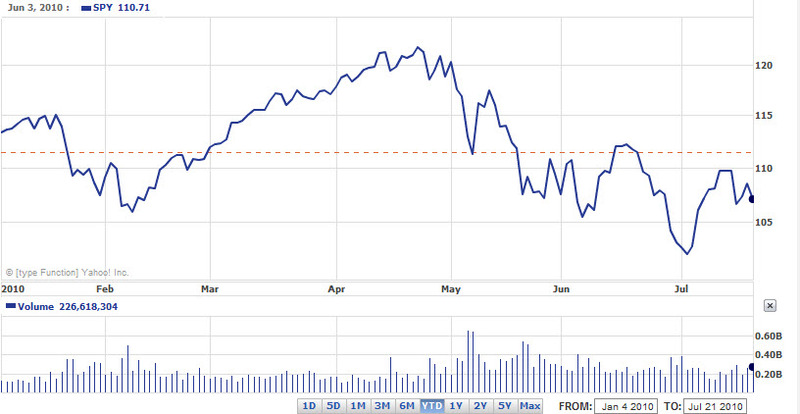 Like any recession, the market will over correct on the downside. Better days are in the future. If you wanted to open a new location in 2006 and decided to wait, today may be your lucky day. Construction costs have dropped, existing restaurant space is everywhere and experienced professionals are looking for employment. Fast Casual Magazine just issued an article Taco Del Mar files for Chapter 11 highlighting the continued woes of chain operators. In the recent 10 days, Daphne's, Pizzeria Uno and now Taco Del Mar have decided to seek protection under Chapter 11 bankruptcy rules. Chef Jason Sandeman is a blogger working in Montreal (my favorite city). In a recent blog post he summarizes the 7 laws of Italian Cooking which if followed will help you eat well for less. Many people are pleased to see 2009 come to an end. Wall Street posted a solid 20% gain and oil prices were well below $100 per barrel. The bad news involved jobs. Month after month, companies shed employees in droves. We can expect the Federal Reserve to leave rates low until the job market turns the corner. Increases in government spending at the federal level will be partially offset by cuts in local and state government budgets. Somewhere in the later half of 2010, I expect the job market to reverse course as employers slowly start adding people to their payrolls. Stocks should continue the up and down motion as the Dow Jones seeks higher ground. Any increase in consumer confidence will translate into profit since companies have reigned in their fixed costs. Will restaurants start filling their dining rooms mid-week?